NAB 2010 starts on April 10 – and S4M – Solutions for Media will be present again in Las Vegas. For 6 days S4M presents software solutions for the media industry on the world’s biggest broadcast fair. S4M’s main focus during NAB will be the systems Dynamics Media and ClipJOCKEY. Dynamics Media is S4Ms “All-in-One” solution for all Broadcast Management needs. Different modules provide the combination of license-, material- and asset management, program planning as well as air time sales. During NAB the S4M team will show how TV Broadcasters can work more effective and cost efficient using Dynamics Media. 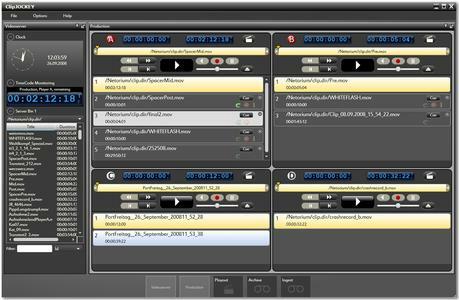 ClipJOCKEY is S4M’s studio production tool tailored to the needs of TV broadcasters and production companies. ClipJOCKEY enables customers to use the best features of their video server hardware and make it a real multi-channel production tool. The system supports most different tasks - from ingest to playout, from recording from live sources to producing TV shows without using tapes. S4M will be present at the NAB Show 2010 (April 10-15), exhibiting with Microsoft at booth SL220, “Solution Area” #22 and with Harris - especially for ClipJOCKEY - at booth N2502. Additionally you find S4M’s ClipJOCKEY at the Omneon booth N5106. The Cologne-based company S4M – Solutions for Media, a subsidiary of Arvato systems and RTL Television, develops and distributes specialized software solutions for the broadcast and new media industry. Customers in 30 countries around the world use S4M systems for commercial airtime sales, video content management, program planning, rights licensing, ratings evaluation, or production planning. S4M also offers customers professional consulting services based on its experience and knowledge of media and information technology.